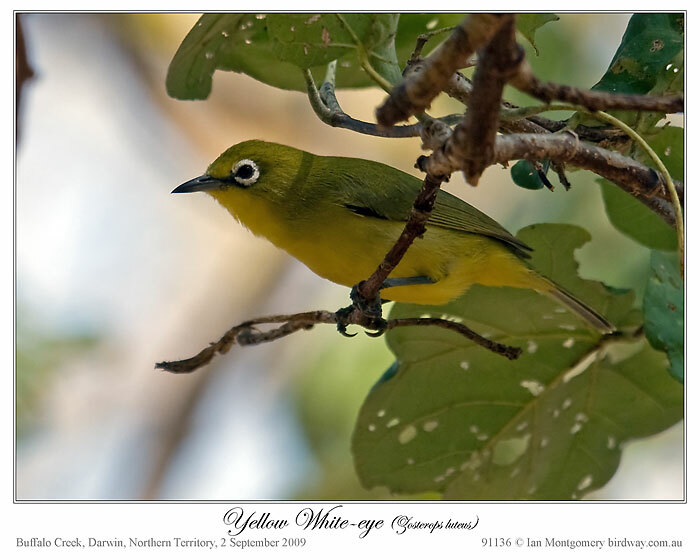 This week’s bird, the Yellow White-eye is a mangrove-dwelling relative of the widespread and familiar Silvereye. 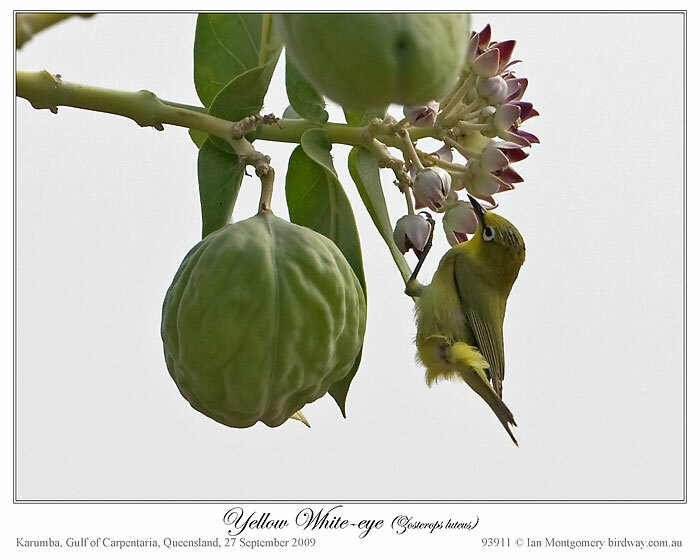 While the Silvereye is well-known in gardens and orchards of all the more densely populated areas of mainland Australia and Tasmania, the Yellow White-eye is confined to coastal areas of northern Western Australia, the Northern Territory and northwestern Queensland with one very isolated population near Ayr south of Townsville. So you have to go out of your way to find it, but it is quite common in suitable habitat within its range. The first photo was taken at Buffalo Creek near Darwin and the second near Karumba on the southern end of the Gulf of Carpentaria. Incidentally, I’d be interested to hear from anyone who can identify the pink-flowered shrub with the White-eye-sized fruit (Yellow White-eyes are 11-12cm/4.3-4.7in). Birds from these regions are yellower than the Western Australian birds and some taxonomists split the species into two sub-species. These yellower northern and eastern birds belong to the nominate race luteus while the greener birds in Western Australia belong to the race balstoni. 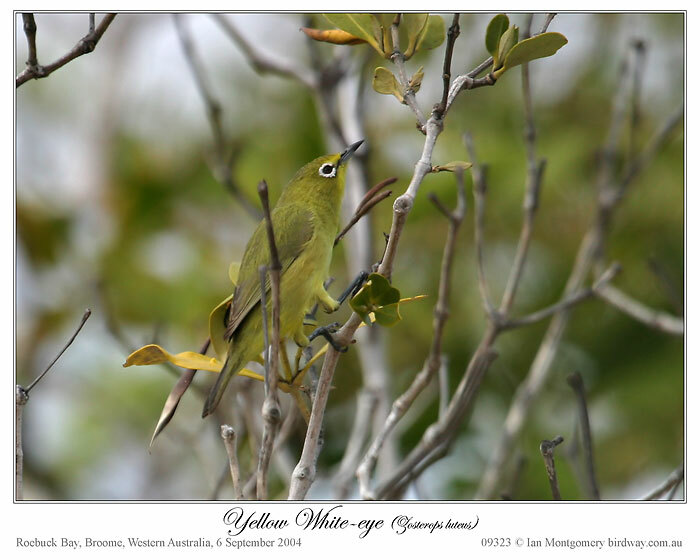 The third photo was taken at Roebuck Bay near the Broome Bird Observatory and belongs to this greener race. The difference is subtle and I imagine you would need to compare birds directly to see the distinction. More striking is how well the plumage matches the colour of the leaves of the mangroves. Like Silvereyes, Yellow White-eyes are very lively and vocal so if they are around, they are not hard to find. The apparently endless wet season has finally ended in North Queensland and this week we have all been enjoying lovely sunny days and moonlit nights. I’m making preparations to travel with friends to the Easter campout being organised by the Northern NSW group of Birds Australia in Baradine in the Pilliga Scrub/Forest between Coonabarabran and Narrabri. There are some interesting birds there (I have my sights set on Turquoise Parrot) and I hope I’ll be able to share some of them with you. Thanks for introducing us to another interesting bird. The I.O.C. World Bird List has this bird as the Canary White-eye. This is another example of why the Scientific names are important. No matter what the bird is called, the scientific name assures that the same bird is being described. I am trusting Ian will be able to capture through his lens that Turquoise Parrot. That sounds like another neat bird. After checking out Ian’s Zosteropidae Family photos, then check the Zosteropidae Family of the Passeriformes Order here. This entry was posted in Bird of the Week and tagged Birds, Birdwatching, Ian Montgomery, Nature, Photography, Zosteropidae. Bookmark the permalink. very nice pictures, it’s good is our generations can see these species.